Curlew conservation measures on a Kildare Bog have been given a boost by funding awarded by the Heritage Council. Irish Peatland Conservation Council (IPCC) were delighted to receive the letter from the Heritage Council last week confirming that they will support the Curlew Conservation Action Programme on Lodge Bog in 2018. The project was launched at IPCC’s World Curlew Day event which took place on Saturday 21st April at the Bog of Allen Nature Centre and was attended by 35 people. Five Curlew were recorded on Lodge Bog during the day having returned to the bog to breed. Visitors enjoyed the rare opportunity to observe the Curlew and hear their iconic call. It was by far the highlight of the day. The Heritage Council funding will be used to put measures in place to give these birds the best chance of successfully breeding on Lodge Bog, such as erection of a fence to prevent livestock from disturbing the nesting birds, predator control measures and liaison with local farmers to agree on Curlew safe farming practices during the breeding season. Further conservation measures will include: continuing engagement with the local community and educational groups visiting the Bog of Allen Nature Centre to build awareness for Curlew conservation, IPCC will undertake a field survey and classify the habitats being used by the Curlew and IPCC will produce a fact sheet and video about Curlew to be published on their website (www.ipcc.ie). Curlew numbers have seen a devastating decline of 96% since the 1980’s nationally . This project is vital in ensuring the best possible conditions for the breeding Curlew to rear chicks in 2018. It means a lot to local people that the cry of the Curlew will continue to be heard in the Bog of Allen. In 2017 the birds made it to the chick stage and with the extra conservation measures in place this year IPCC hope to see chicks fledge. 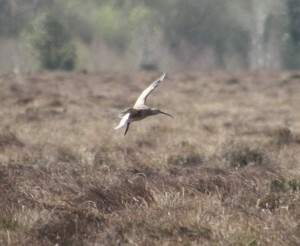 For more information on Curlew conservation visit www.ipcc.ie or contact Katie Geraghty at bogs@ipcc.ie or call 045 860133. The Curlew Conservation Action Programme 2018 is also part-funded by the Department of Culture, Heritage and the Gaeltacht. This entry was posted in News and tagged Bog of Allen, Bog of Allen Nature Centre, Conservation, curlew, Lullymore, World Curlew Day. Bookmark the permalink.